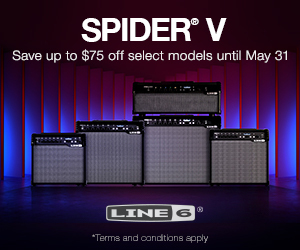 How Much More Can Your Pedalboard Rock? 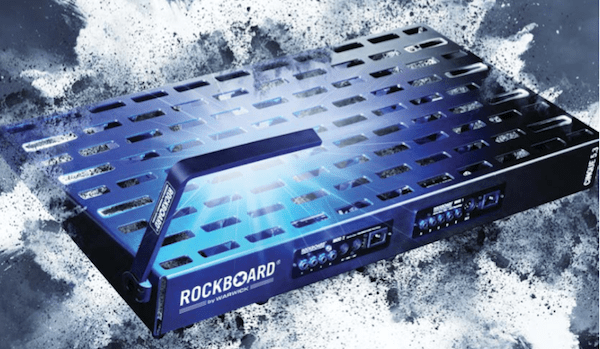 With New RockBoard Products From Framus, A Lot More! Anything can be made into a pedalboard. Go ahead. Try it. Old skateboard decks? This writer has seen players make these into pedalboards. A broomstick? OK, maybe you need a couple of them and a saw to make it work, but it can be done. A pizza box? 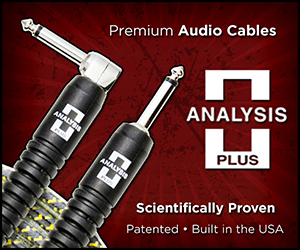 Maybe it’ll last you one gig, but you could do it. You wouldn’t even need Velcro; the old cheese at the bottom will probably secure that Klon Centaur just fine. The point I’m illustrating here is that pedalboards are some of the most straightforward, easily fabricated pieces of gear out there. If I gave you $20 and fifteen minutes in your local Home Depot (that’s a hypothetical, so don’t email me), you could get what you needed to build one. Still, TheToneKing.com compatriots at Framus and Warwick continue to improve on their wildly popular and practical RockBoard pedalboard line. Many new additions and design features, influenced by feedback from musicians around the world, will be on display at this year’s Winter NAMM. 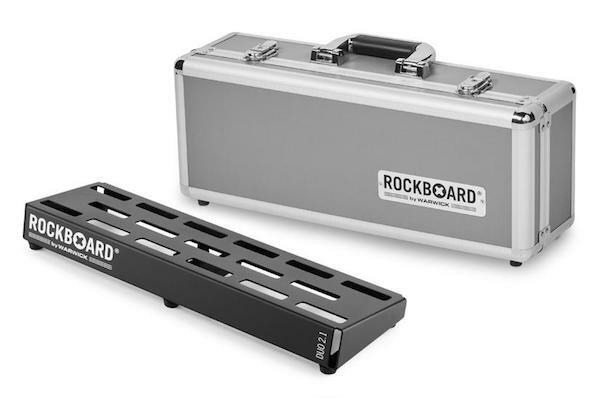 Responding to the continued popularity of compact, “fly rig” style boards designed for easy portability, a new option has been added to the RockBoard line in the form of the Mini Duo 2.0. Weighing in at just a smidge over one pound and providing just over one foot of pedal real estate, the Mini Duo 2.0 is a perfect match for your top “desert island” pedals or simple rigs that just need a little bit of seasoning with a few choice outboard effects. It’s also perfect for “emergency” situations like, say, your massive, custom-wired board gets “the sads” and decides it doesn’t want to play that killer gig at Big Bubba’s Bowl-O-Rama. The Mini Duo 2.0 is small and light enough to toss in the rear seat of your Chevy Nova without a second thought. Existing RockBoard models are also getting in on the update fun. 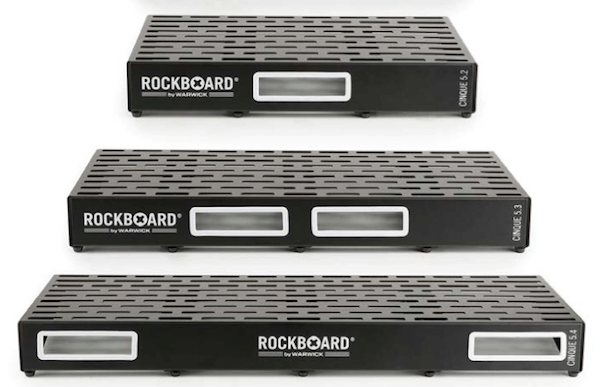 RockBoard’s universal power supply mount, The Tray, will have more mounting options on RockBoard’s Quad 4.2 and Cinque 5.2, 5.3, and 5.4 models, providing additional layout flexibility. The slot grids of the 2019 RockBoard models have also been expanded all the way to the edge of the board to accommodate RockBoard’s new QuickMount plates. 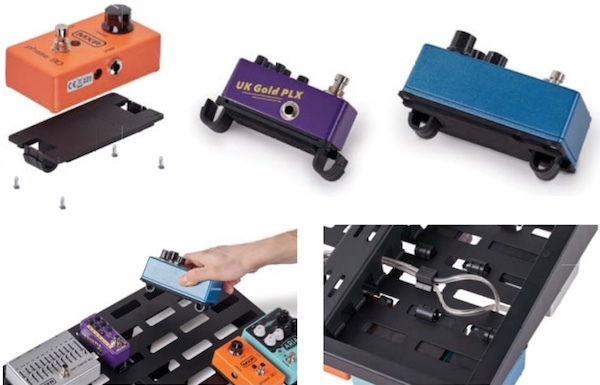 Instead of using messy adhesive-based mounting products, the QuickMount plates use the existing screws on the bottom of your pedals and attach to your RockBoard by way of a unique, rounded tab designed to fit snugly in the slot grids. 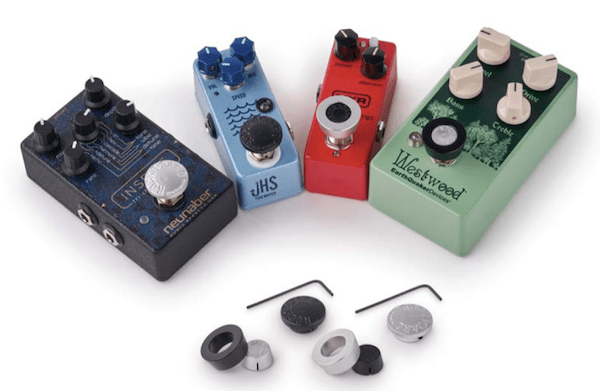 Just pick the size appropriate for your pedals…there are fifteen to choose from, covering pretty much every pedal manufacturer you can think of…attach the plate with the specialized connectors to the bottom, and secure it to your RockBoard. Your signal chain stays in places until you need to make a switch using the special release tool to detach it from your RockBoard. If you want even more security for your setup, the RockBoard PedalSafe is a great add-on to the QuickMount system. The PedalSafe is a clear casing that fits over your pedals, keeping your settings safe and your pedals free from gunk, dirt, spilled margaritas, and other detritus that can damage and degrade pedal performance. Pedal controls are still easily accessible through a detachable cap. Now, no matter how hard you gig your pedals will continue to look new while your boutique relic guitar looks…more relic’d? 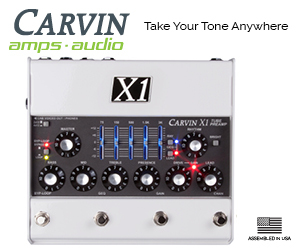 There are also all kinds of ways to customize your RockBoard beyond the typical. There are BigToe and StomPete footswitch toppers to enlarge the usable are of your pedal’s stomp switches and making them easier to find and use on dark stages, LED lights to add a little flash (or help out your eyes a bit), PatchWorks solderless cables and Flat Patch cables for compact, customizable connection solutions, and of course, RockBoard’s new MOD V2 pedalboard power amp modules, now available in 75 and 150 watt power levels. If you make it to 2019 Winter NAMM, the Framus and Warwick booth (Hall D, booth 4636) will have a lot of inspiring RockBoard products that will significantly up your pedalboard game. So yeah, go ahead and make a pedalboard out of that old barn board from Grandpa’s soybean farm. It’ll work. But it won’t rock.